Despite being fired for lying under oath and leaking to the press in a manner that “lacked candor,” former FBI Deputy Director Andrew McCabe has received an outpouring of support from the left. In addition to Rep. Mark Pocan (D-WI) offering him a temporary job so he can receive his full retirement benefits, dozens of people have set up GoFundMe accounts, which have already raised tens of thousands of dollars. Some have expressed surprise that the same people who have long railed against “the man” are so overwrought that an FBI Official – who was found corrupt in an IG investigation demanded by Democrats that and that was directed by an Obama IG appointee – was fired by an administration they don’t like, that they’ve put the closest thing to “Agent Smith” on a pedestal and are now giving him money. So far 39 GoFundMe donation campaigns have been set up for the former Deputy Director who’s now left with a reduced pension. 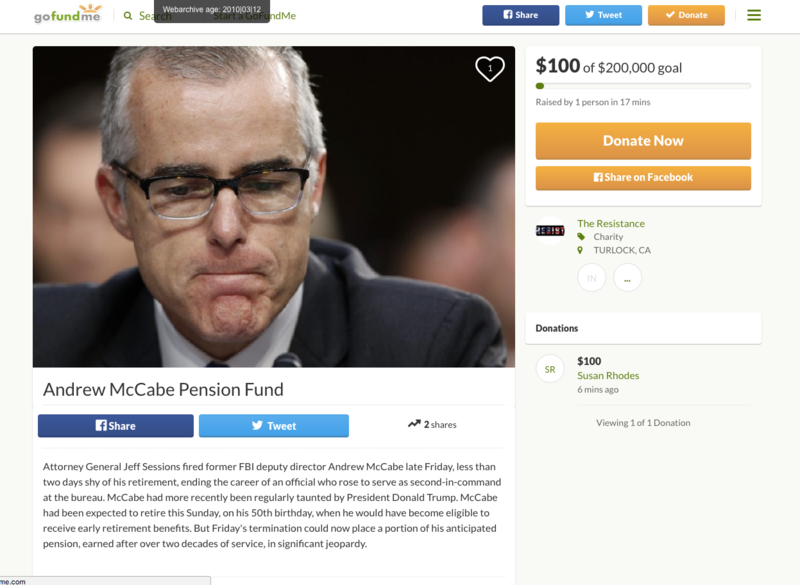 Chicago resident “Ethan,” for example, who describes himself as a “volunteer” set up a campaign for $75,000 despite not knowing much about McCabe’s pension. So far Ethan the campaign has taken in $1,961 of its $75,000 goal. Meanwhile, McCabe isn’t “losing his pension.” While the Friday termination will impact him financially to some degree, the most significant impact is that he doesn’t get to start taking it for another seven years, and he will likely lose his lifetime medical benefits for he and his wife. Considering McCabe’s number of years at the agency and estimations of his high-level pay grade, formulas published by the US Office of Personnel Management for law enforcement officers show that his yearly payout could hit in the area of $60,000 each year, if McCabe were to retire after his birthday on Sunday. If he were to be fired before Sunday, it appears likely McCabe could be docked his pension until he hits another, later age milestone. Furthermore, McCabe can earn his full pension if he’s employed in any federal position for just another day or so.